Posted on April 3, 2013 by Elizabeth E.
I’m not yet “jammified” (in my p.j.’s) but I could be, for how energetic I (don’t) feel. Bob Hope noted that “You never get tired unless you stop and take time for it.” So I’ve taken some time for it this week, after my Ta DA! post of earlier. 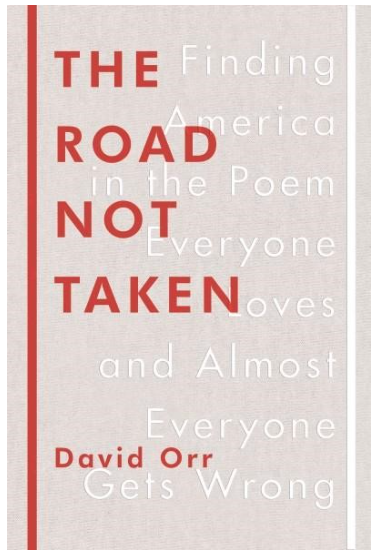 I also heard Joyce Carol Oates once talk about how, after a novel was newly finished, she took her time to coming back from working–she read poetry until she felt sufficiently ready to start work again. 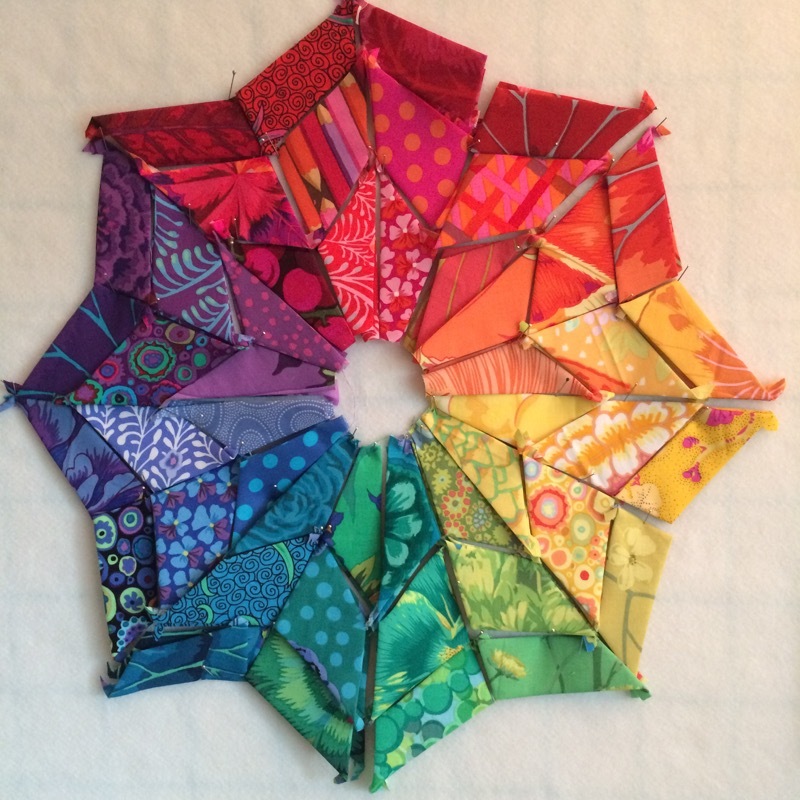 I was asked to teach a class on the Lollypop Tree quilt, as I’ve noted before, I made up my own pattern, and thought I should get going on the class sample. It was intended to be a Kaffe-fabricked Christmasy design on Kona red. 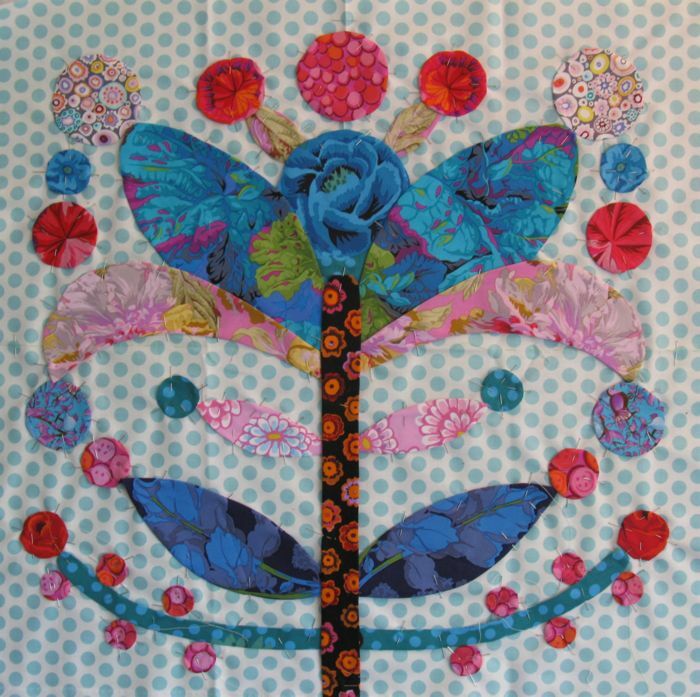 What it ended up becoming was a whimsical Kaffe-fabricked design on aqua polkadots. The red one is still in my future. . . perhaps tomorrow, after I grade some of the late essays and finish up prep for class. I became stuck on this one leaf. You can see the progression, of trying desperately to become unstuck, and I just noticed I put two of the same in the photo. Ignore that. I finally got to this point, and although I’m still not happy with parts of it, most of it is coming together. Eric Maisel said that “If, because of anxiety and self-doubt, you procrastinate and only think about working, you’ll feel more exhausted than if you’d created for hours.” I certainly had a lot of that going on today, but I think it was also because I was listening to the end of a Graham Greene novel, which was driving me a bit batty. Then I switched to This American Life and listened to the two-part episode about Harper High School, which starts *here* and ends *here,* which I’m still thinking about, and which should be required listening for every American, no matter where you stand on the gun-control debate. It was sad, frustrating, illuminating and it got me working through my puny problems of how different pinks should go where. Perspective is always a valuable thing. Then I went downstairs to the kitchen and made two dinners: tonight’s and tomorrow’s, as I don’t get home from class until later and my husband and I just aren’t up for cooking, or for going out. 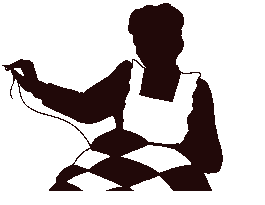 After dishes, I finished off a good book–the latest Guido Brunetti mystery–and then traced off and cut out another Lollypop Tree, ESE-style, to begin again tomorrow with a red background, for my shop sample for the class. I was talking to a biologist friend once, describing how sometimes I felt as there was nothing creative coming forward (this was when I was an undergrad in Creative Writing) and yet the deadlines didn’t seem to go away. “Ah,” she said. “You’re in lag phase.” I didn’t know exactly what it meant, but the gist of it was that while I felt like I was doing nothing, my ideas were percolating, growing, or “metabolically active” as a biologist would say, before I entered a time of real growth (log phase, if you must know). I’ve experienced this more than once. During that time, I feel unfocused, blasé, wiped out, or just plain stupid, if you must know the truth. I ingest vast amounts of silly internet videos, or lollygag through quilt images online, or read blogs without commenting. Then slowly, something shifts, I become truly bored with being bored and I get back to work. Posted on October 30, 2012 by Elizabeth E.
I’m thinking about all those affected by the horrific storm on the East Coast. I have several quilty/blogger friends, as well as quite a few family members who have been affected and hope that they and their families are through the worst of it. I’ve been on a blogging break this week from the computer (I wrote this post earlier) but I just wanted to jump in and send my thoughts to those who are dealing with this “Frankenstorm” and its aftermath. Take care, everyone. 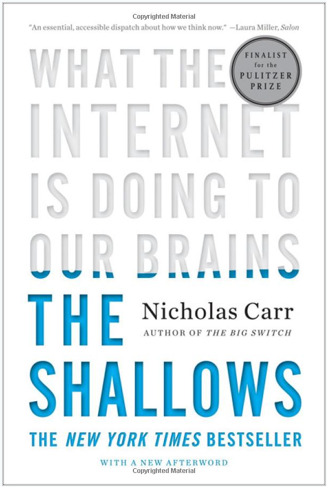 In my class at school, we just completed a unit that was based on this book by Nicholas Carr, titled, The Shallows: What the Internet is Doing To Our Brains. We had our Discussion Panels last Wednesday, and it was fascinating that the students were fairly perceptive and able to discuss how the Internet has impacted their lives, for better or for worse. 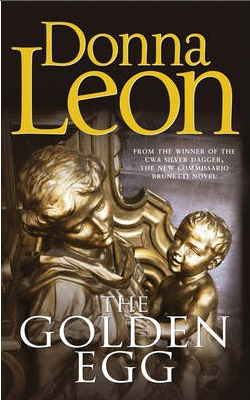 One young man is fairly sanguine about the whole thing, saying, “Well, it’s here. We just have to deal.” Another pair of young women took opposite positions on the question of whether print was dead. The internet’s main impact, that of re-wiring our brains due to neuroplasticity, was skirted around, but acknowledged when they all complained of the inability to finish a book before distractedly checking their phones for texts or messages. I thought about how quilting has changed from the time when I used to trace a pattern onto cardboard, carefully cut it out and tape the edges for stability. Then I’d trace it about a bazillion times in order to make a quilt, following along the pencil line for the seam. 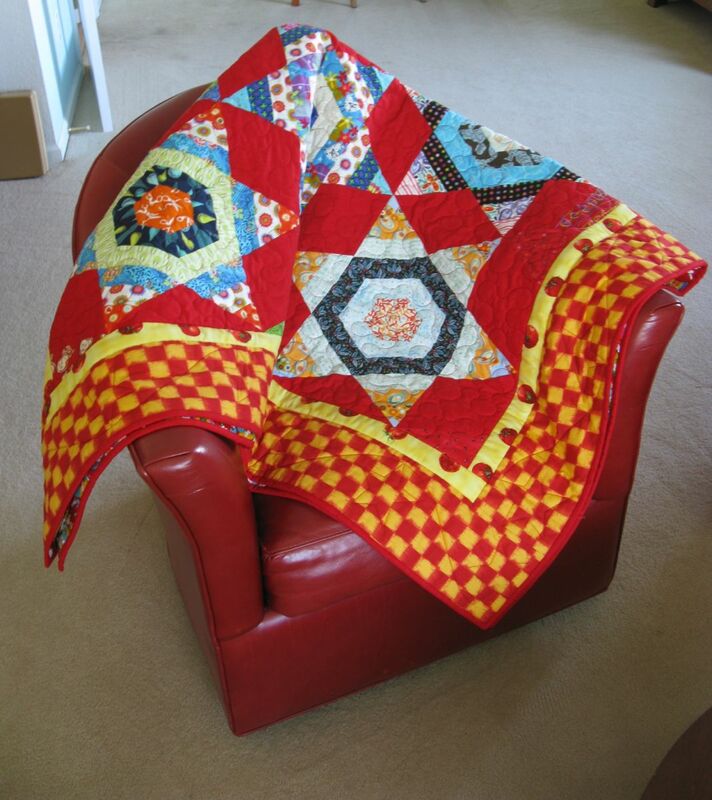 I did use a machine for piecing, but hand-quilting was the only way to finish a quilt. That’s why my list of 100 Quilts took so long to grow: our tools were more primitive before the advent of rulers and rotary cutters. 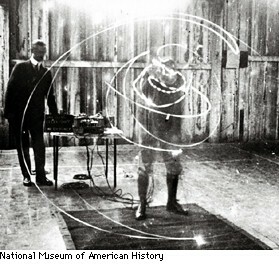 He also references Frederick Taylor’s Time-Motion studies and how it has changed how workers do their jobs (above: a golfer takes a swing). Before Taylor came along, “the individual laborer, drawaing on his training, knowledge and experience, would make his own decisions about how he did his work. He would write his own script” (218). 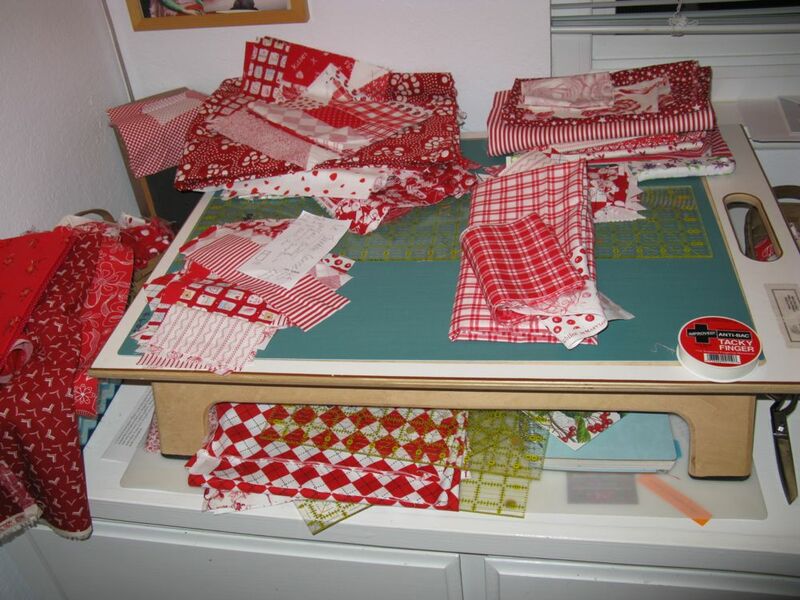 I hope I never become such a slave to a pattern or a ruler or a system of making a quilt that I can’t make a creative and conscious detour into creativity. 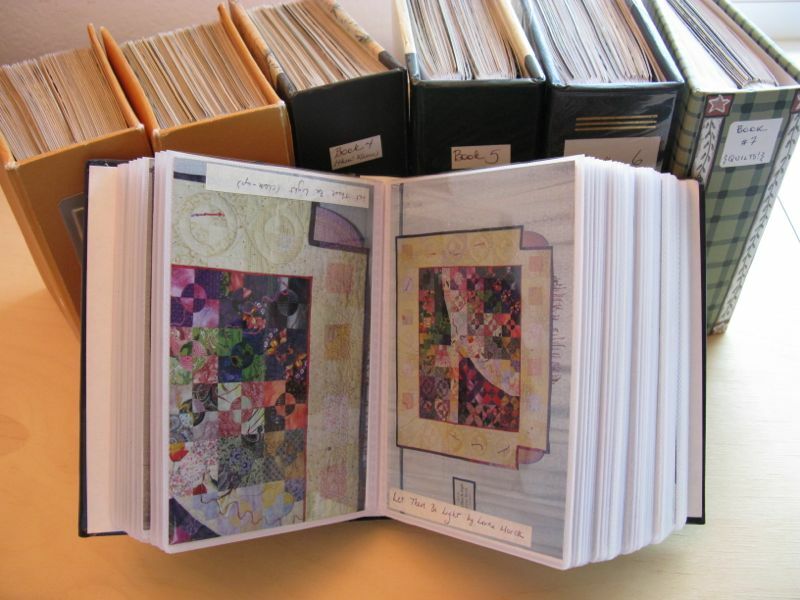 But sometimes I wonder when I make a copy of another’s quilt, using one line of fabric if I’m not caught in a type of quilt-machine using Taylor’s demands for proscribed motion. Is this creativity? Am I being creative, or just following someone else’s script and benefitting from their decisions? 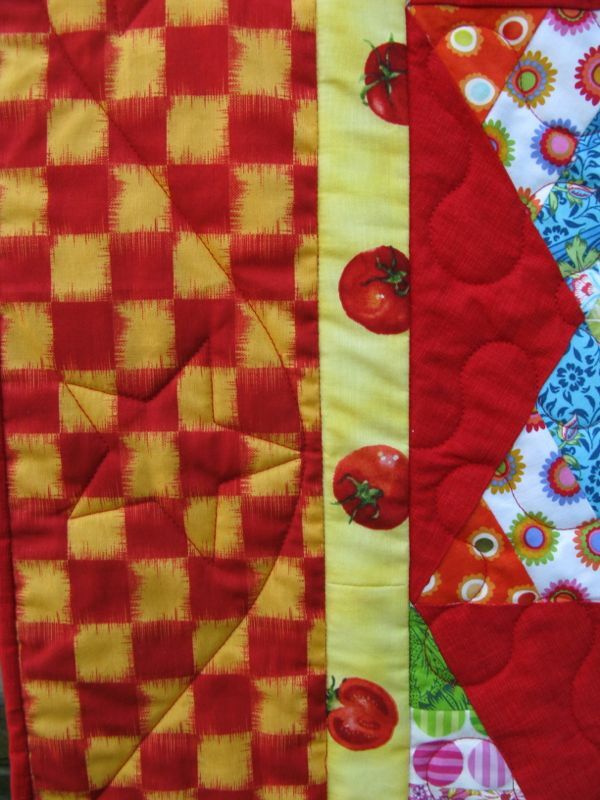 And like many of you, I’ve been following #quiltmarket on Instagram. Carr said more than once, and I’m paraphrasing here, that trying to control the flow of information from the internet is like trying to take a drink from a fire hydrant at full blast. The internet caters to the new! unique! amazing! as we all know. 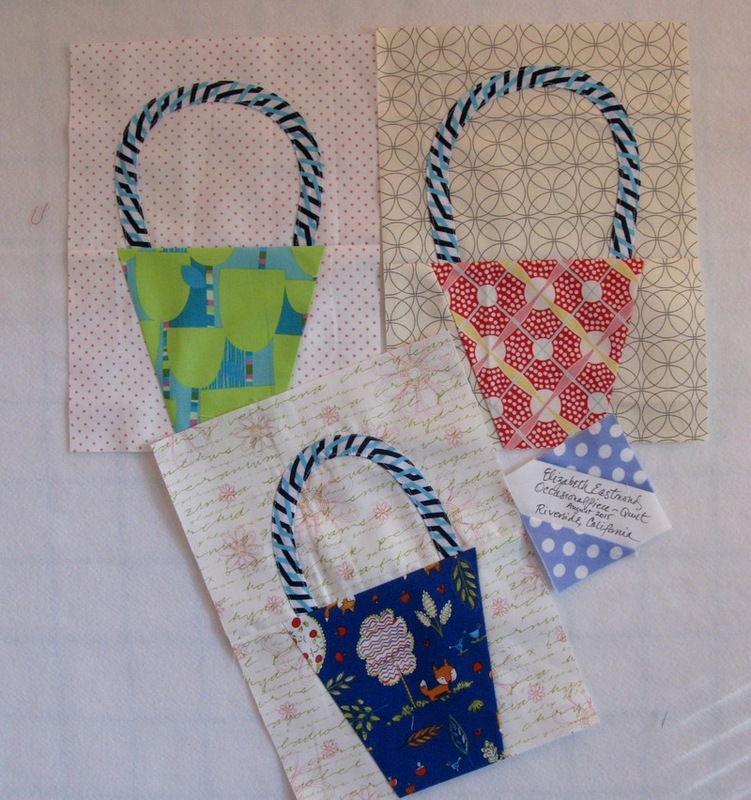 I also have Pinterest boards full of ideas, most are quilts which I’ll never make, but pin them up there nonetheless. Can we be creative 24/7, or is that too exhausting? 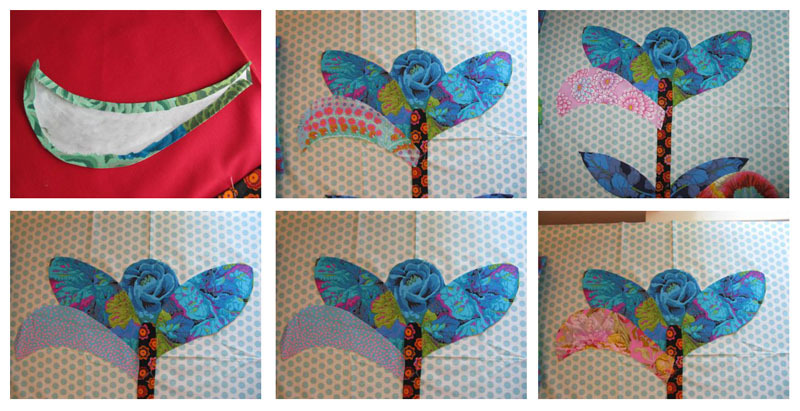 Has the Internet made better quilting possible? 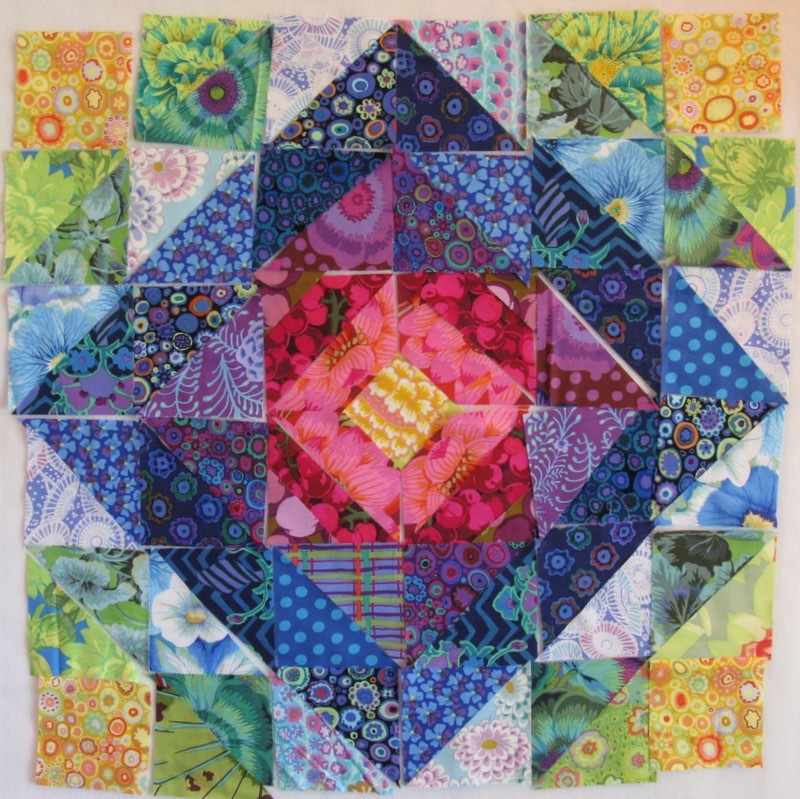 More interesting quilting? Given us an access to a wider range of styles and types? I don’t know the answers to these questions. 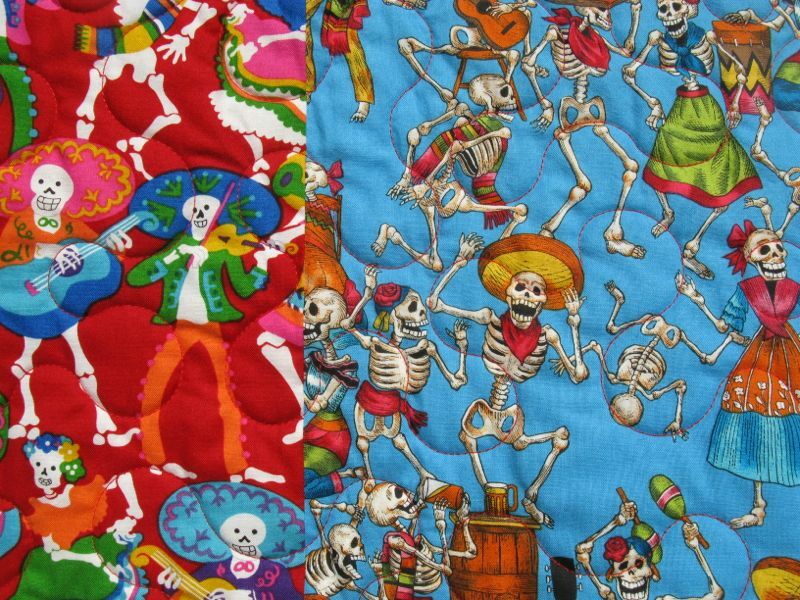 I only know that sometimes the Internet affects us quilters, too. So my question now, is how has the Internet affected you? And has it been for better. . . or for worse? Posted on September 13, 2012 by Elizabeth E.
Woo-hoo! All the little Polaroid blocks arrived from the Polaroid Block Swap. 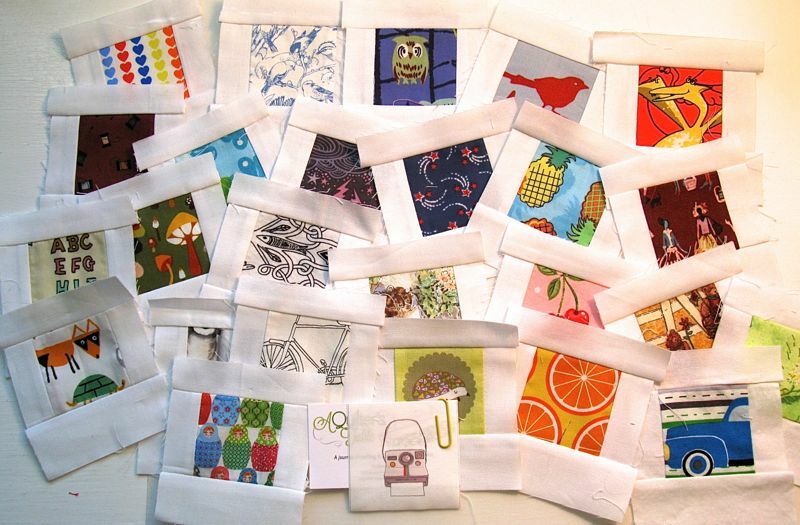 I laid them out and looked at them all, and really thought some lovely quilters somewhere had done a fine job making little bits of fabric in a frame. 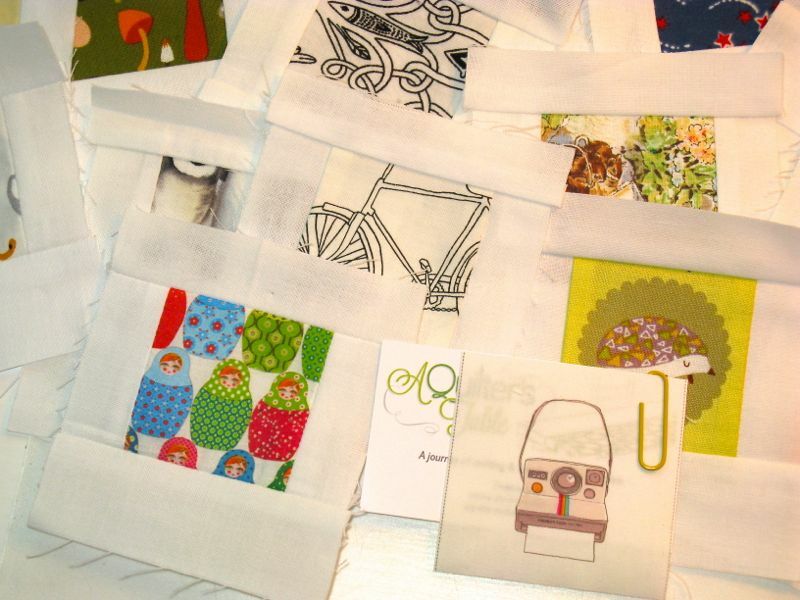 On the left is one of my favorites, a series of matryoshka dolls (Russian nesting dolls) of which I have a small collection, and the small bit of cloth that Debbie sent along with the batch of blocks: a Polaroid image on a 2″ square, which can be either a label on the back, or made into a block to go with the others. I had a great time participating in this and appreciate Debbie’s efforts. 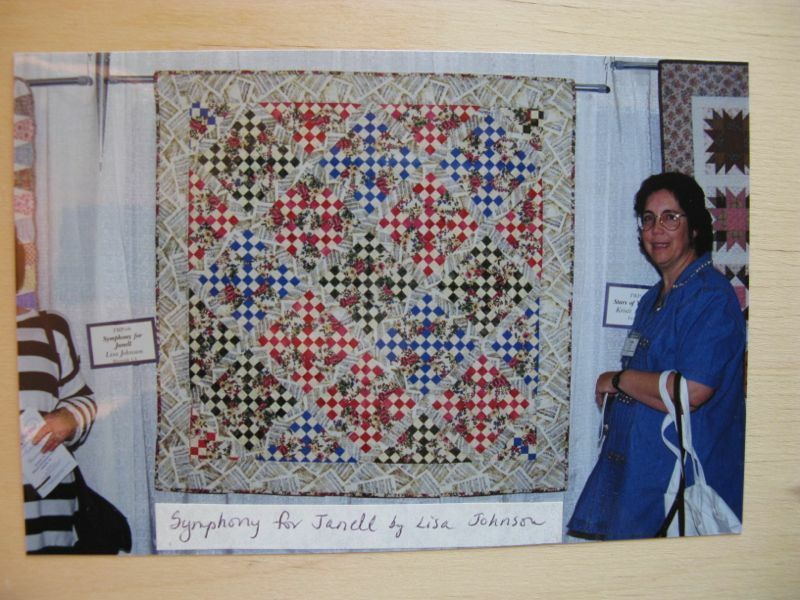 And from those pictures, to another kind — the old-fashioned kind — taken at local quilt shows. I used to take a few rolls of film (remember film?) in my bag along with my camera, come home and get them developed, then put them into little photo books to look at in between shows. 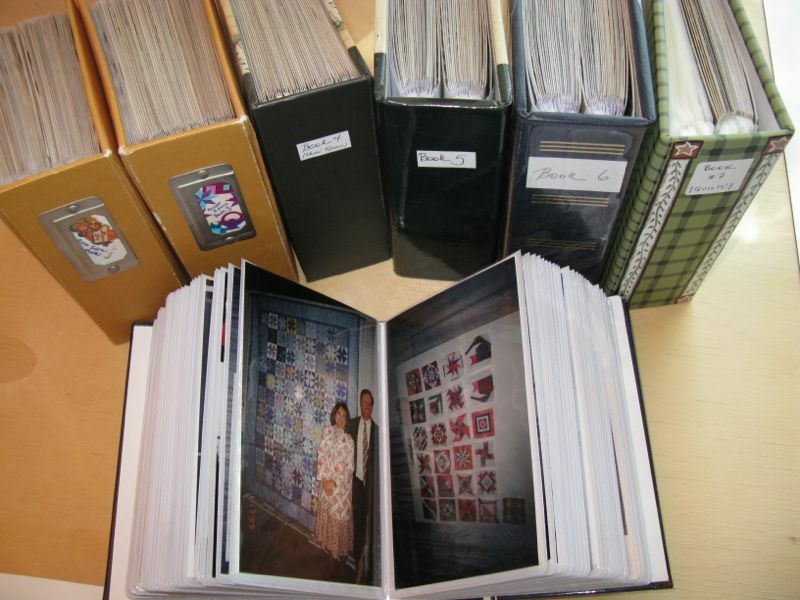 At one time, we traded photos, made our own little books, bought magazines in order to get our ideas for quilts. 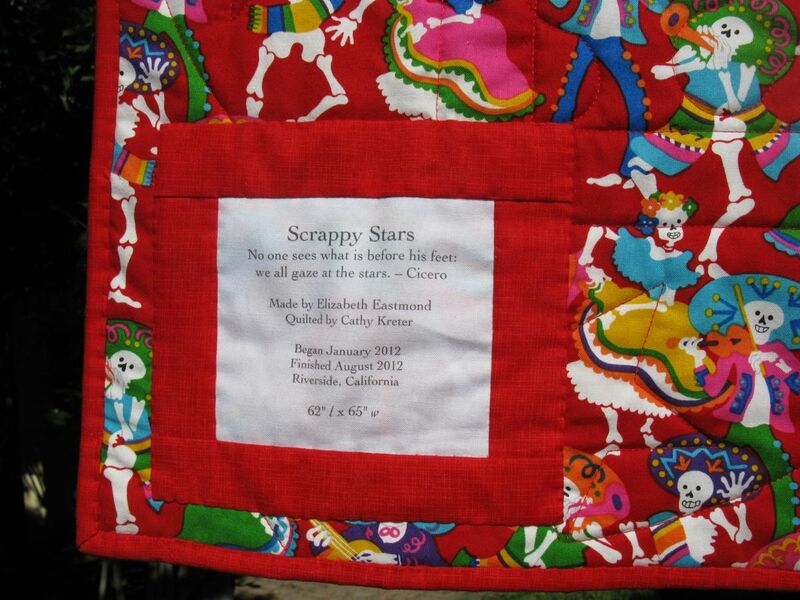 This is my friend’s quilt, hanging in Road to California, with another friend standing beside it. These are all in the pre-internet days, but even so, it’s kind of hard to remember what we did before we could just pop onto a series of blogs, or to Pinterest, or even Instagram. I have six of these little books, tucked away. 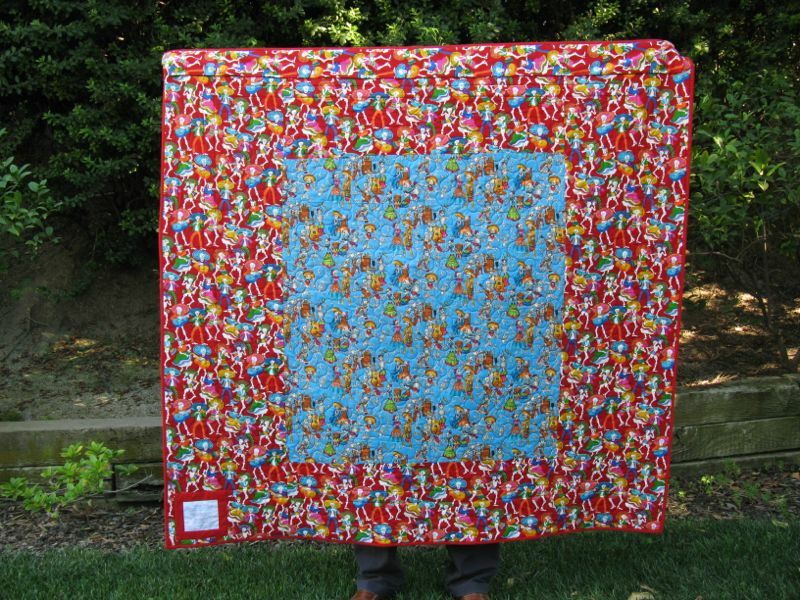 On the left in that picture are Dave and I standing by my quilt that was hanging in Road to California (a different year than Lisa’s quilt). And yes, I’m wearing a quilted jacket. 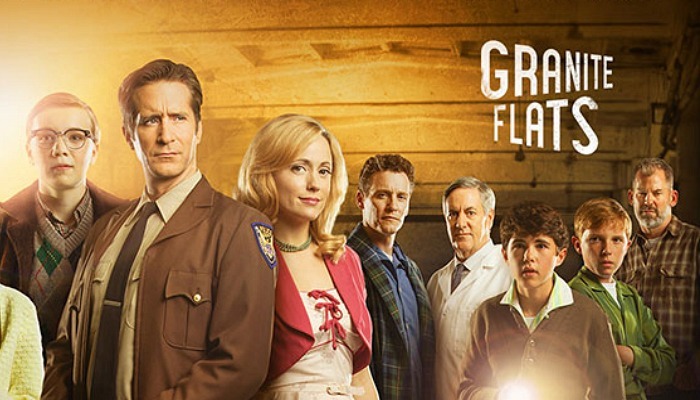 (Boy, do I look like an early quilter.) 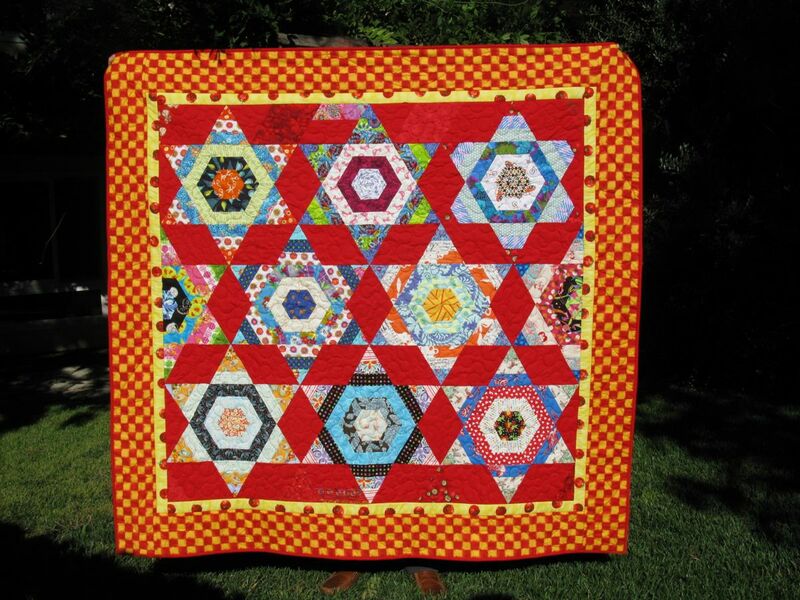 Even though quilt styles change and the modern quilt movement has influenced a lot of our designs, I still like looking through these when I come across them occasionally. 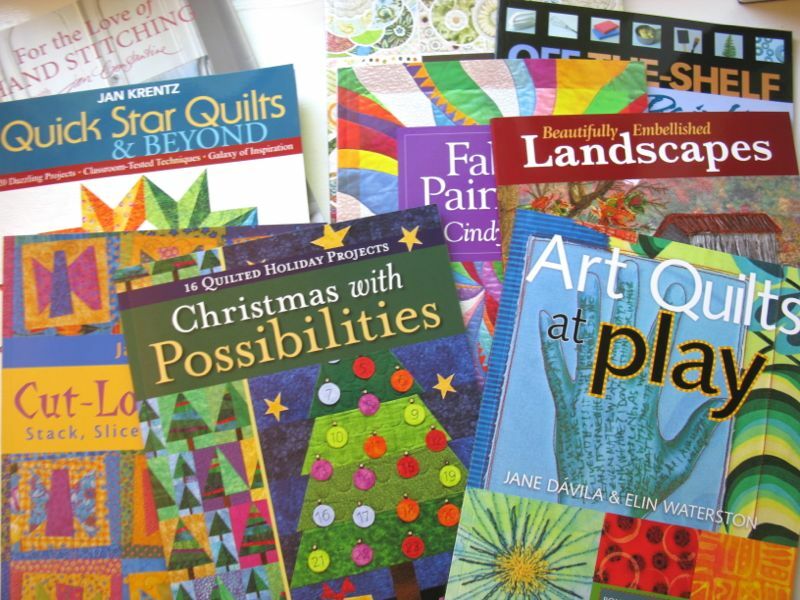 Last book-y thing: I shopped C & T’s clearance sale and came up with these fun books. 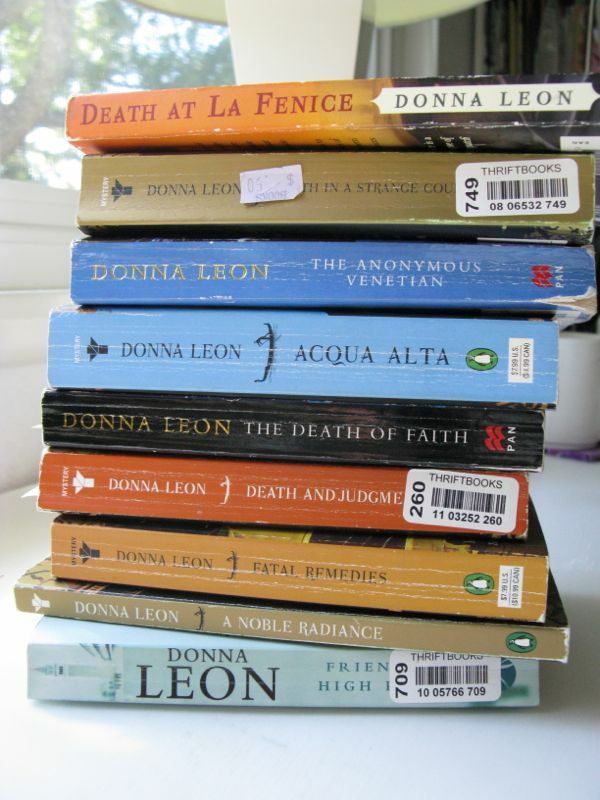 While not all the books are new, and even some are sort of “vintage” it is enjoyable to browse through them when you’ve only paid a pittance for them. You really should get on C & T’s mailing list, if you aren’t already. So, now I’m off to sew sew sew before reality will hit and I’ll have to grade the Argument Terms Test that I gave in class on Wednesday. You can bet that I’m putting off reality as long as I can.